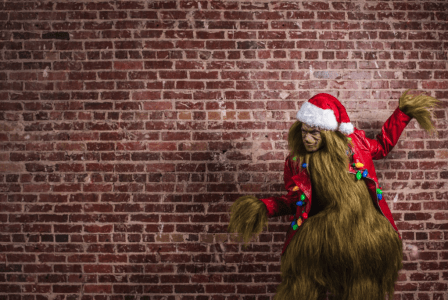 THE GRINCH’S ARRIVAL — The “Mean One” himself is coming to Ponce City Market! Throughout the day, selfie-stick-carrying Who-ligans of all talents (hula hoopers, acrobats, graffiti artists, and more) will roam the grounds and interact with shoppers. At 5:30pm, The Grinch will ceremoniously crash onto property in his steampunk sleigh with entourage in tow, complete with an aerial and ground acrobatic performance as the crew flies from the Central Food Hall rafters! Later, The Grinch and his faithful performing dog will take up residence on the second floor of the main market hall for photos with guests. THE GRINCH IN RESIDENCE — Following his initial grand entrance, The Grinch will make his way back to Ponce City Market with great fanfare, taking up residency each and every Saturday and Sunday through December 18th. Starting at 10am, The Grinch parades in with the Who-ligans. He will be seated in his sleigh throne until 8pm; pay him a visit, take a photo, and share it with #PCMMerryAndBright to help grow his small heart three sizes. PONCE CITY SANTA — Don’t forget Santa! Ponce City Market will offer FREE photos and visits with Mr. Claus, no appointment required. Santa will be in residence downstairs every Saturday leading up to Christmas Eve from 10am-8pm. Share your Christmas snap with Santa using #PCMMerryAndBright.